Ramshackle—without design, out of square, loosely connected, out of kilter. 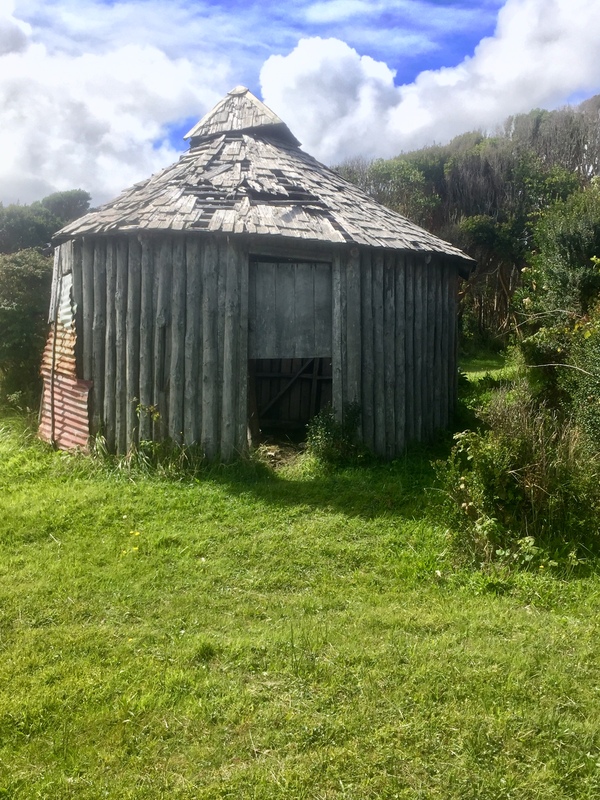 Buildings in Chiloé, particularly out in the country, ramble with a certain insouciance. Additions jut at angles making impossible rooflines. The Hospedaje Paloma in Cucao is one such establishment. I ended up with a newly added small (unheated) room all to myself—real luxury after weeks of bunk rooms or the divine privacy of a tent. Even though his rooms meander over the lot behind the old church and community soccer field, they are well built. I’m fairly certain Victor, the proprietor, is also the carpenter and a careful craftsman, even though he must of necessity (transportation costs for materials must be high on this side of the island) make do with what comes to hand. In other words, the hospedaje is bricolage. Rain poured on the corrugated steel roof all night, but the morning was briefly clear. I packed, ready for my trek up to Colé Colé, a beach and some highlands about 16 km up the coast. I would be following more or less the same path as Darwin— down the road for a while, then on the beach before plunging into the bush for the last, most difficult part. Victor invited me into the kitchen for coffee , bread and butter. Most houses (and restaurants for that matter) heat with wood, and even though we are technically still in summer, the weather is cold and damp, so people spend a great deal of time sitting near wood stoves. Victor and Elena’s kitchen is a place to savor. The walls and ceiling were carefully joined and vanished pine. Along one wall are wide benches that could double as bunks near a large black and chrome wood cookstove. A fire burned brightly, heating a kettle for the coffee, but also a little one for Victor’s maté which he sipped constantly through the standard metal straw. A large cylindrical water tank encircled the stovepipe, both heating water and providing thermal mass to stabilize the room temperature. In hostels and small places in the country, the coffee is usually instant Nescafé, and is always served with very hot water—it takes a long time to finish a cup— which this morning was good as the skies opened up while I sat, a serious downpour. No one else in the room spoke any English and their rural accents made it impossible for me to even begin to follow their talk. Victor asked if I was going to Castro and I replied that I was heading to Colé Colé. At that, his friend (a bus driver) said no—no one would go to Colé Colé today. I decided I’d see how the day would unfold, and unfold it did. Starting north I could see the clouds moving off to the east, and a huge blue sky open before me. With a good spring in my step, assisted by masses of ripe blackberries growing on the roadside, I soon covered the road/bridge section of the hike to Colé Colé. The first bridge, which I had seen yesterday on my churchyard wandering, is most peculiar. A single lane, woodtimbered bridge is common, but this one has a curving bulge in the middle, looking every bit like it was made from an old wooden ship. The curved decking and bulkhead in the middle even has portholes. I couldn’t decide if it was all functional—to enable fishing from the bridge—or pure whimsy. Crossing the next low bridge, I found myself on a wide, hardpacked beach, with the waves crashing several hundred meters from the dune line. The sun still shone bright where I was, but over the water clouds gathered. I set off at a brisk pace, hoping to cover the 6 km before the weather turned. With the first drop, I dropped pack and geared up. No sooner did I zip in my rain pants than the skies opened like a small explosion. Were I on a long-distance trek, there would have been no question but to continue right into the teeth of it, but this was just a pleasure outing, almost a day hike, so, measuring the distance between the far exit point and my nearby entry, I did a rapid about-face and headed back. Normally such a move would have brought disappointment, even a sense of failure, but the trekking/adventure gods were properly propitiated because soon, appearing out of the storm and honking a horn, was a four-wheel drive pickup—small Toyota club cab—full of local farmers. This area is populated by the descendants of those same native dwellers Darwin derided on his boat ride. They motioned for me to hop in the back, so I wasn’t out of the rain, but I also wasn’t walking in it. 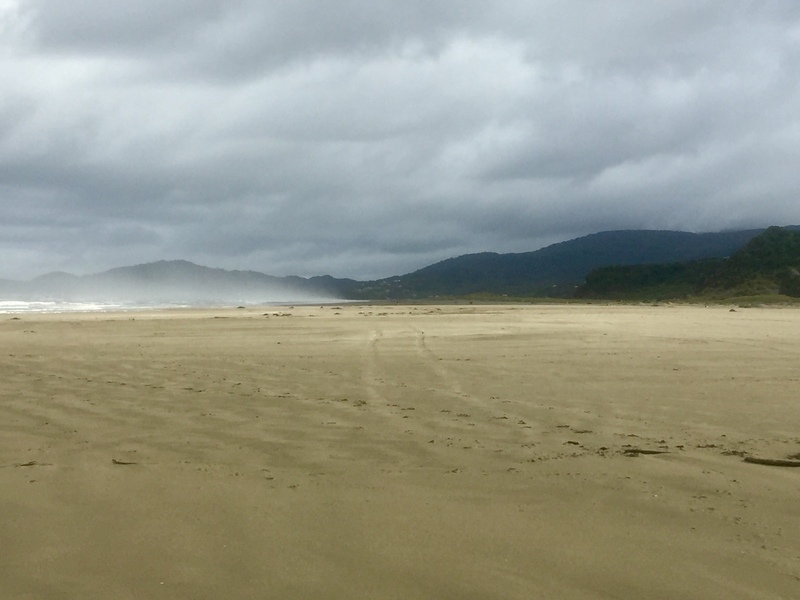 Clearly experienced driving on the beach, the driver maneuvered through several small streams, then abruptly turned left, heading straight to the river flowing at the base of the hills. Right before splashdown, he spun hard right, crossed some outflow watercourses and drove with the left wheels in the river straight at the dune protecting the low bridge just past. We bounced, pitched, yawed, but didn’t roll and soon were on the road, retracing in minutes what had taken me a good part of the morning to cross on foot. They deposited me at the gate to National Park in front of the bus stop, which I took as both a sign and a judgment—time it head back to Castro. 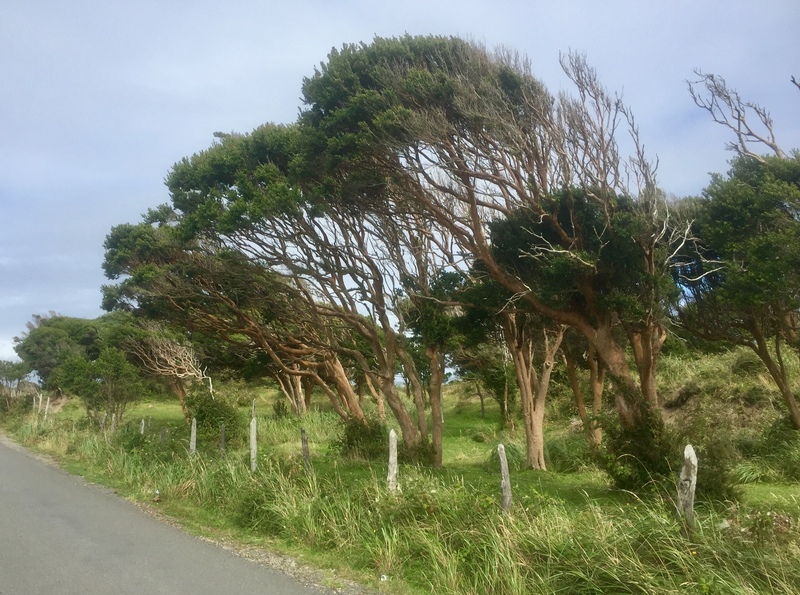 They shook hands, waved, and spun off to their chores, and I warmed up with a cup of coffee and soon found myself on the return route to Castro, disappointment tempered by a twenty minute thrill ride in the wild dunes of Chiloé.